The first word that comes to my mind when I think about this novel is "epic". "Gardens of the Moon" are not only a long book (650+ pages depending on the edition), the numerous strands that are laid out from the start and the impressive number of memorable characters (returning to the dramatis personae section is often necessary), can make it hard to get into. And that's just the first of ten novels in this massive series! The main plot does not seem too complicated at first glance. The Malazan Empire is torn by long wars fought on different fronts. It is firmly ruled by Empress Laseen who commands her deadly Claw assassins. Her firm rule started after her assassination of old Emperor Kallenved. This situation is presented from the perspective of Whiskeyjack and his squad of sappers - the legendary Bridgeburners. After suffering heavy and unexpected losses in a siege of Pale, the soldiers struggle to find their place in the aftermath of the battle. As the dust settles and the readers can begin to feel at ease with numerous (though well-defined) characters, Erikson begins adding more twists to the plot, thrown in several new characters who act independently of the Bridge Burners, in completely different places and in practically different realities too. Some of them are: a young thief Crockus along with his peculiar friends, powerful alien mage Anomander Rake and his elite host (inhabiting "The Moon's Spawn" - a giant floating fortress), alchemist Baruk, Quick Ben - a mage of many talents, Tattersail - one of the few mages who survived the battle of Pale, Adjunct Lorn and unlikely companion who are on a secret mission to free an ancient power, Kruppe who is... (who the hell is he? I've no idea but he's my favorite character by far, it's really hard to describe him, I wouldn't know where to begin). Each of them brings a lot to the story and nicely moves the plot forward by adding a different perspective on the events taking place in the book. If you thrown in a mix of gods who enjoy meddling in the affairs of mortals and play their own games without considering their impact, you get a really interesting mix. It may seem like humans are the ultimate pawns of gods in this brutal reality but the truth is the mortals play them as well to their own ends. This interaction is truly fascinating and Erikson handles it masterfully. It's a dark, brutal world but the fate of humans is not entirely grim. There are individuals who rise above others and despite being drawn into various conflicts against their will, their actions have profound effects on the world (captain Paran comes to mind immediately). The numerous plots and a mind-blowing array of original characters can be confusing. The action shifts seamlessly from one character to another and at times this seems like a bit too much to follow with so many unanswered questions to remember about at the same time. "Gardens of the Moon" is definitely not a plain novel, it's is a challenging book and some may even get discouraged from reading it after being overwhelmed by all the facts presented in it. I've actually re-read the book. 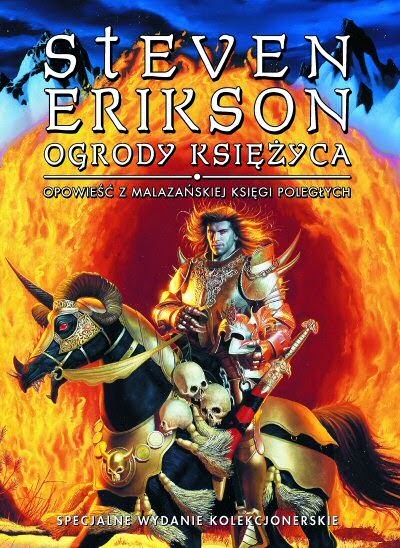 I read it in Polish (the cover from that edition can be seen above - it's probably my favorite) the first time several years ago. I read the original version this time round and it was still a very enjoyable read. The complexity of Erikson's work can make it hard to sympathize with the protagonists at first. There are so many of them and the author doesn't seem to focus on developing their personalities too much. At the same time he hints at significant events in the past that shaped who they are. It can be hard for a reader who encounters Erikson's work for the first time but at the same time it is understandable that he wouldn't want to give away too much in the first novel of his 10 book-long series. After finishing it I felt that many questions were answered but at the same time even more were posed and I look forward to reading the second novel. Mother of Monsters #4 It's Evolution Baby!